Global Piezoelectric Industry Market Research 2019 | Market Research Reports® Inc. Global Piezoelectric Industry Market Research 2019 report is published on March 15, 2019 and has 162 pages in it. This market research report provides information about Electrical Products, Electrical Components, Computing & Electronics industry. It covers Global regional market data and forecasts. It is priced starting at USD 2,600.00 for Single User License (PDF) which allows one person to use this report. In this report, we analyze the Piezoelectric industry from two aspects. One part is about its production and the other part is about its consumption. 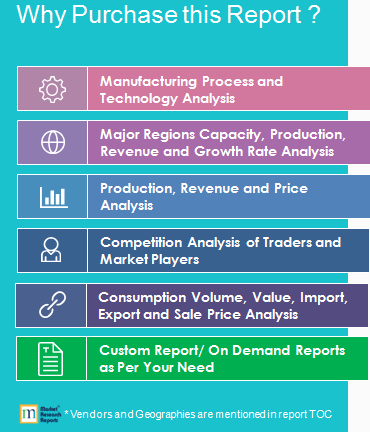 In terms of its production, we analyze the production, revenue, gross margin of its main manufacturers and the unit price that they offer in different regions from 2014 to 2019. In terms of its consumption, we analyze the consumption volume, consumption value, sale price, import and export in different regions from 2014 to 2019. We also make a prediction of its production and consumption in coming 2019-2024. At the same time, we classify different Piezoelectric based on their definitions. Upstream raw materials, equipment and downstream consumers analysis is also carried out. What is more, the Piezoelectric industry development trends and marketing channels are analyzed. 1. What is the global (North America, South America, Europe, Africa, Middle East, Asia, China, Japan) production, production value, consumption, consumption value, import and export of Piezoelectric? 2. Who are the global key manufacturers of Piezoelectric industry? How are their operating situation (capacity, production, price, cost, gross and revenue)? 3. What are the types and applications of Piezoelectric? What is the market share of each type and application? 4. What are the upstream raw materials and manufacturing equipment of Piezoelectric? What is the manufacturing process of Piezoelectric? 5. Economic impact on Piezoelectric industry and development trend of Piezoelectric industry. 6. What will the Piezoelectric market size and the growth rate be in 2024? 7. What are the key factors driving the global Piezoelectric industry? 8. What are the key market trends impacting the growth of the Piezoelectric market? 9. What are the Piezoelectric market challenges to market growth? 10. What are the Piezoelectric market opportunities and threats faced by the vendors in the global Piezoelectric market? 1. To provide detailed analysis of the market structure along with forecast of the various segments and sub-segments of the global Piezoelectric market. 2. To provide insights about factors affecting the market growth. To analyze the Piezoelectric market based on various factors- price analysis, supply chain analysis, Porte five force analysis etc. 7. To track and analyze competitive developments such as joint ventures, strategic alliances, mergers and acquisitions, new product developments, and research and developments in the global Piezoelectric market. Power Distribution Unit (PDU) downstream is wide and recently Power Distribution Unit (PDU) has acquired increasing significance in various fields of Telecommunications and IT, Finance and Insurance, Energy and Medical Insurance. Globally, the Power Distribution Unit (PDU) market is mainly driven by growing demand for Telecommunications and IT. Telecommunications and IT accounts for nearly 63.06% of total downstream consumption of Power Distribution Unit (PDU) in global. The Current Transformer ( C.T. ), is a type of “instrument transformer” that is designed to produce an alternating current in its secondary winding which is proportional to the current being measured in its primary. Carbon Brush is a device which conducts current between stationary wires and moving parts, most commonly in a rotating shaft. Its basic applications are electric motors, alternators and electric generators. The characteristics of carbon brush material measured by carbon brush manufacturers are as follows: self-lubrication, conductivity, durability, and rid ability during sliding contact. Since the high-end products have huge demand in both China’s and global market, many local companies attempt to enter the high-end production competition. Currently, China’s carbon brush industry is transiting to produce high-end products; furthermore, it offers benefits to the entire industrial chain. The worldwide market for Carbon Graphite Brush is expected to grow at a CAGR of roughly 2.1% over the next five years, will reach 2390 million US$ in 2024, from 2120 million US$ in 2019, according to a new study.